MOA Targets has a confession to make. We’re really, really conservative with our steel ratings. 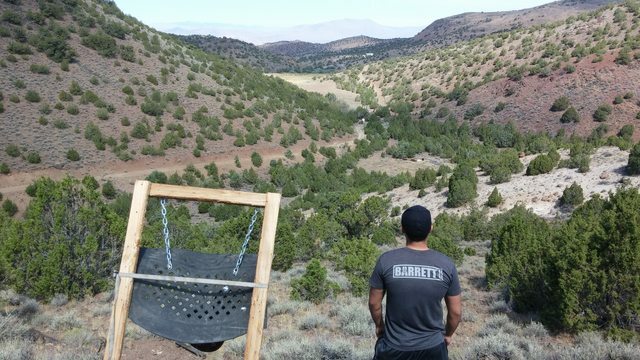 We state our minimium distances based on industry-wide standards to ensure safety (12 yards for pistols, 100 yards for rifles), and to minimize damage to the targets (distance varies by caliber and target thickness, see target descriptions on website for details). 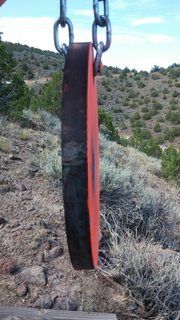 Until a few days ago, we had not personally tested our steel with 50 BMG. As a result, we rated our 1/2″ AR500 for 1,200 yards, and our 1″ AR500 for 600 yards. 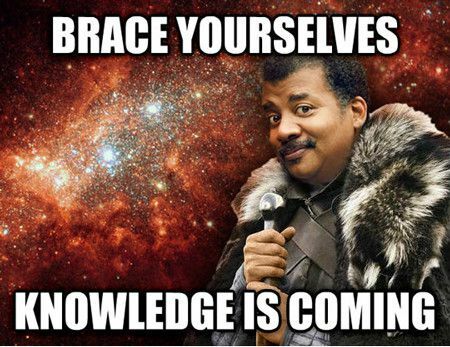 After some pretty extensive testing, we’re ready to update those numbers. Our test platforms were McMillan and Barrett bolt action 50 BMG rifles, each utilizing Hornady 750 grain A-MAX ammunition. 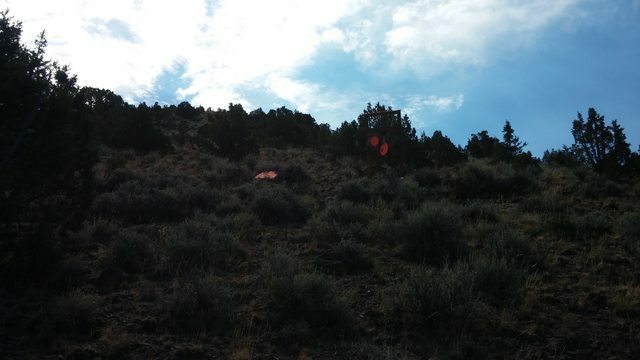 Our testing began at 800 yards, and the range was decreased after each stage of the test until failure of the target (pitting or denting) was noted. Pitting is caused by excessive velocity, denting is caused by excessive energy distribution. 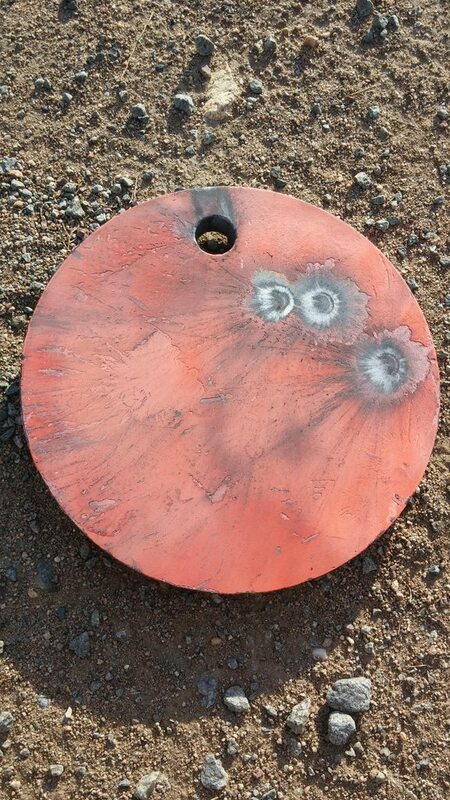 Steel core or jacket can cause premature pitting, holing, or cratering of the target. More information on pitting vs denting available in a previous blog post. The targets were produced by MOA Targets for this test. We used a CNC plasma cut 12″ diameter 1″ thick AR500 target, with one 1.25″ mounting hole ($191, free shipping) and a 4,000W CNC laser cut 10″ diameter 1/2″ thick AR500 target, with two 0.42″ square mounting holes ($55, flat rate eligible). A well used laser cut MOA full size IPSC Metric in 3/8″ ($187) was at the line as well, so we tested it, just for drill. 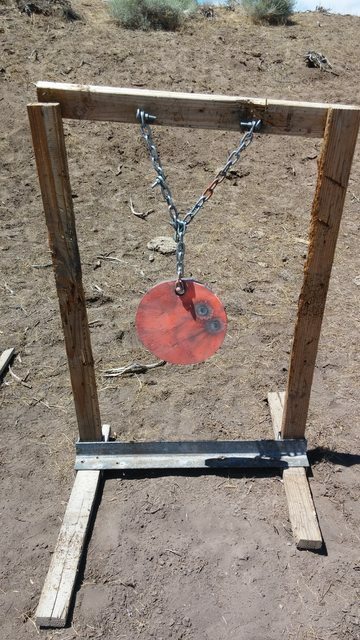 Targets were mounted on a 36″ MOA Battle Born stand and top plate, using MOA chain hang kits. An old floor mat was used to stabilize the targets and reduce swing. 1″ AR500 – no pitting of the target surface, or deformation. Due to target hanging malfunction (I screwed it up), we failed to engage the 1/2″ AR500 at 800 yards. The 3/8″ AR500 took perceptible but minimal damage. 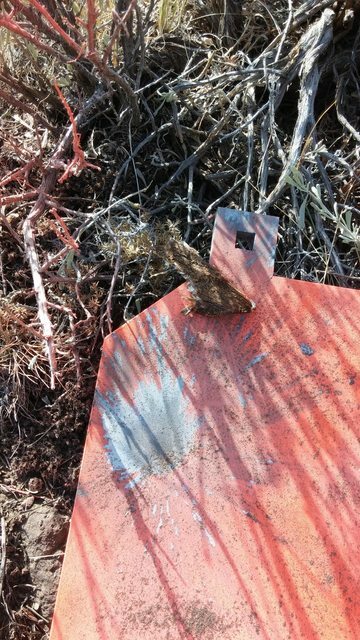 No pitting, but there was detectable deflection of the plate, observable from both the target surface and the back of the plate. Based on the 800 yard results, we discontinued tested the 3/8 AR500, and moved in to 400 yards to continue the test. At 400 yards, we observed slight deformation of the 1/2″ AR500, and no pitting or deformation of the 1″ AR500. For comparison, we put one round of Singapore milsurp M33 steel core ball ammunition into the 1″ AR500. Minor (3-4mm) pitting of the plate surface was observed using the M33 ammunition at 400 yards. No denting or deflection was observed. For safety reasons, MOA does not recommend using any steel core or jacket ammunition on steel targets, ever, and considers the warranty void if magnetic ammunition is used on a MOA target. At 300 yards, we changed the setup a bit, and hung each target on it’s own stand, but had run out of Battle Born Top Plates on the MOA Skunkworks range. Turns out they’re important. At 300 yards, the 1/2″ AR500 target displayed notable deformation, and testing discontinued on 1/2″ AR500 target. The 1″ AR500, however, was a different story. 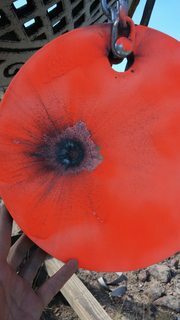 1″ AR500 MOA Target, 12″ diameter, 1.25″ mounting hole. Tested with 50 BMG. At 300 yards, the 1″ AR500 showed no pitting, target surface deformation, or backface deformation. So we moved in to 200 yards. At 200 yards, the 1″ AR500 showed no pitting, target surface deformation, or backface deformation. So we moved in to 100 yards. At 100 yards, the 1″ AR500 showed no pitting, target surface deformation, or backface deformation. So we called it a day, because we didn’t see any need to test the safety guidelines, and 100 yards is as close as rifles should ever be fired at steel. MOA will be updating the website and flow chart to reflect the results of these testing activities. Hence forth, 3/8″ AR500 will be rated for 1,200 yards with 50 BMG, 1/2″ AR500 will be rated for 600 yards with 50 BMG, and 1″ AR500 will be rated for 100 yards with 50 BMG. We’re still super conservative, but now we’ve got field testing to back it up. Thanks for taking the time to read this, and I hope the information is helpful. Please keep MOA Targets in mind for all your target needs.